The ELM327 Bluetooth OBDII scanner with the Microchip PIC18F25K80 microcontroller is an engine performance and diagnostics tool for both automotive enthusiasts and professionals. Paired with your Android smartphone, tablet or Windows Computer, the ELM327 Scanner allows you to easily scan and clear engine codes, view and save real-time engine data and perform emission readiness tests. As I said in the review I couldn't say it any better. This product worked very well with my nissan sentra.using the NDS apps. 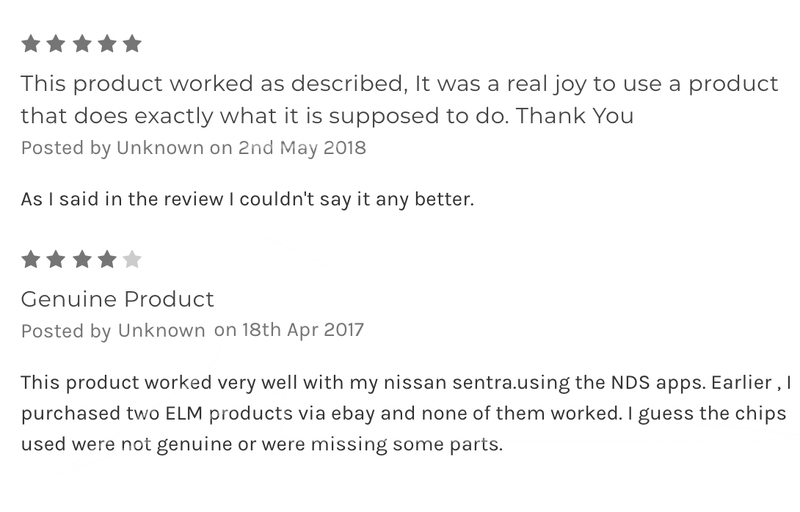 Earlier , I purchased two ELM products via ebay and none of them worked. I guess the chips used were not genuine or were missing some parts. Nice unit but I can't see the connection lights because they are on the back side so I don't know if it is connected.